For most drinkers (I hate the word consumers, one might consume margarine, but not wine) it is difficult to say which Champagnes are good, or great, and which Champagnes are not so good. 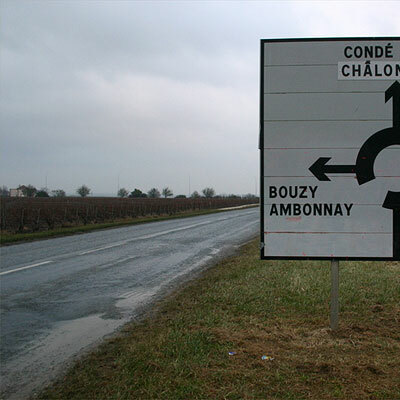 The only classification available is the échelle des crus with 17 grand cru villages followed by 41 premier crus. But who knows the names of these villages − apart from the fact that today some of these classifieds fail to produce top quality. For the region as a whole this is a strength. 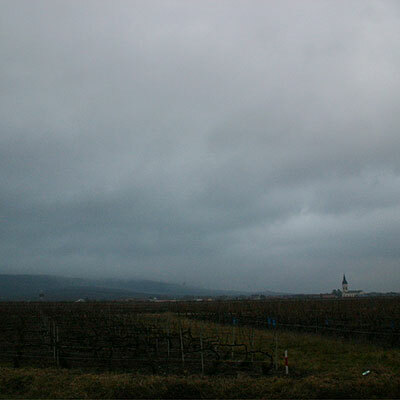 As a brand Champagne is France's strongest appellation. But it means that one will have to put some effort in finding the real treasures. 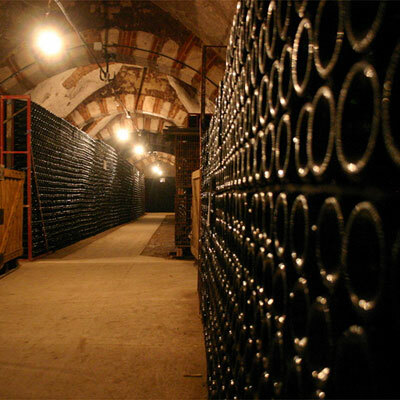 Or make a safe bet by choosing for Moët's Brut Impériale − or a comparable well-known Champagne. This posting is about our visit last weekend to Champagne Barnaut in Bouzy, a leading Récoltant-Manipulant producing Champagne in one of the grandest grand crus, the commune of Bouzy in Montagne de Reims. Barnaut can best be characterised by its freshness, its purity and its elegance. Be it the refreshing and straightforward Brut, the fascinating Extra Brut − almond, grape skin − the lively-elegant-fruity Rosé, the vinous Blanc de Noirs or the suave and complex Millesimé... you will never see me spoil any of these wines. When I tasted Barnaut in 2008 for the first time, I knew I wanted to work with this Champagne. 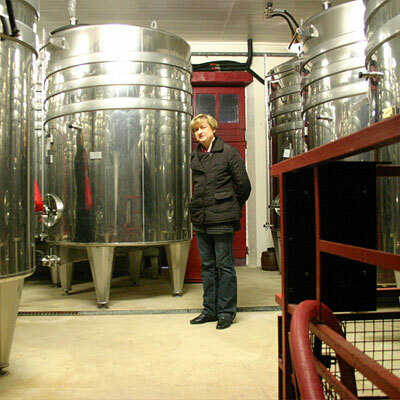 Barnaut's non-millésimé's contain about one third of older vintages − the vins de réserve −, stored in stainless steel vats. The 1/3 cuvée de reserve is a mix of wines with different ages, up to 8 years. This is old, but it adds to the quality, the refinement of the Champagne. 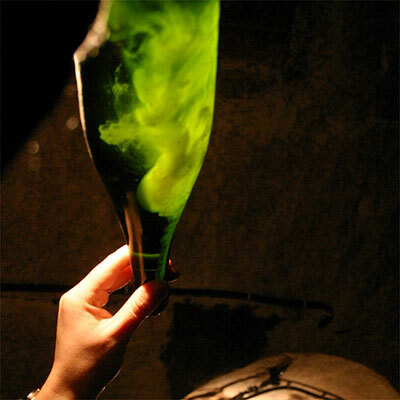 When the new vintage and cuvée de reserve are blended, the average age of the resulting wine is 3 years. It happens that the amount of millésimé-wine is brought down in order to keep up the quality of the non-millésimé's... all for the sake of quality! 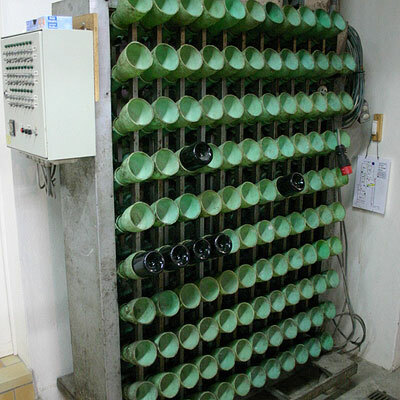 What is not shown on these pictures: the new press (a huge cylinder which, when being loaded, sinks in the floor), and the modern gyropalettes for the remuage of the bottles. 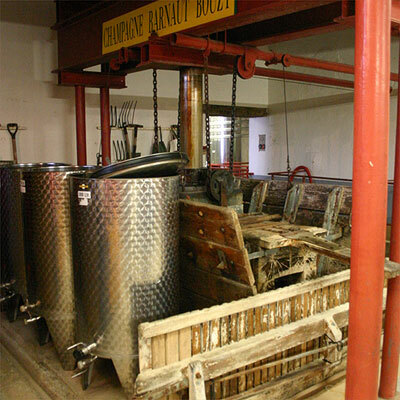 The most exciting part of the tour was the visit to the cellar, which we reached by means of a slow elevator. We sank deep into the prehistoric sea, from about 80 million years ago: a vast layer of chalk. As said, the elevator was slow, so we fully experienced the depth of the cellar: 15 metres! With the tirage yeast and sugar are added to the blend. Then the second fermentation takes place (in the bottle). This cellared stage takes two years. So once Barnaut reaches the consumer its average age (for a non-millésimé) is five years. Yes, we may call this Slow Wine. Dutch readers who now got thirsty, do not worry, just see here. I'm drinking a half bottle of the Grande reserve as I write this, and would describe it simple as "Clean, smooth, and powerful."